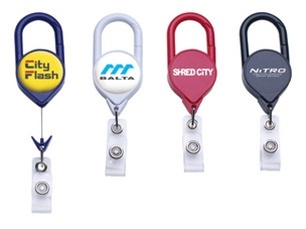 Custom Jumbo Badge Reel w-Carabiner is made from recycled material. Custom Logo Jumbo Badge Reel features welded sonic plastic body. Custom Jumbo Badge Reel w-Carabiner is 4 colors: Opaque Black, Blue, Red, and White.